Born out of Hawaii, poké bowls (pronounced poh-kay) is set to be the next big thing in the way of smoothie bowls. 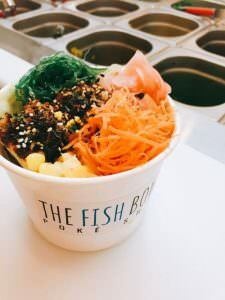 KL got one of its first poké bowl parlours this year with The Fish Bowl, a BYOB (build your own bowl) concept that allows patrons to design their own meal. 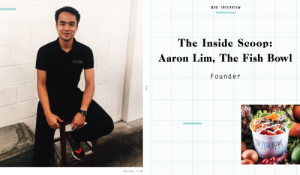 We sat down with founder Aaron Lim to talk about all things poké — read on to learn more about this culinary sensation, and how to recreate your own poké bowl at home! 1. Tell us briefly about the Fish Bowl. How did you decide to open a poké-bowl concept restaurant? It all started when my partners and I noticed that it is an upcoming trend in the US, and the presence of similar outlets overseas. After visiting them and really enjoying the food and concept, we decided to recreate it at home by referring to the menu online. It turned out way better than we expected and the rest is history. 2. 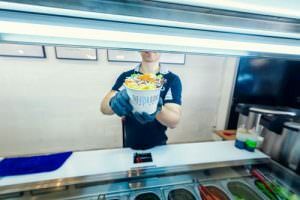 How would you explain the concept of poké bowls to your customers? Poké, derived from a Hawaiian term, means to slice or cut. The ingredients in a bowl are usually sliced into thin slices or chunks. You’ll usually find in one raw ahi tuna, green and white onions, sesame oil and soy sauce — this is known as Hawaiian-style poké. 3. Some people liken poké bowls to a Western-influenced, elevated mixed rice (chap fan). What are your thoughts? Poké bowls are a great option for those looking for something fast and fresh with ingredients that won’t leave you feeling bloated after eating. 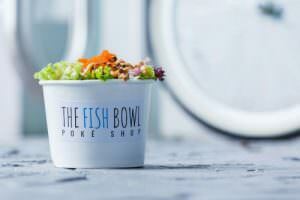 It’s a rice bowl for sashimi and salad devotees but with a variety of ways of customisation. Unlike chap fan, a poké bowl offers a well-balanced meal on top of it is unique taste and flavors. 4. Poké bowls are all the rage right now. Do you think this will just be a fleeting trend or are they here to stay? We believe poké is here to stay as Malaysians are moving towards clean eating. Poké further stands out as it offers not only a healthy meal, but is also rich in its abundance of flavors. 5. Describe your perfect poké bowl, as if it was a person. My perfect poké bowl can be likened to chef Gordon Ramsay. He displays obnoxious behaviour and he’s all big, scary and fierce at work, yet deep down inside he is a big softie at home, and a lovable and caring dad and husband. Take our Spicy Sriracha Salmon for an instance. It may be all fiery and spicy in the mouth, but it is mixed up with the various condiments and toppings that actually tamper down the spiciness towards the end. It’s a healthy dish that warms one’s stomach with jam-packed flavours. 6. How do you choose what goes on the food offerings here? We’ve been through many R&D sessions just to get everything in order. Besides selecting the best quality and type of ingredients including rice, vegetables and fish, we also take into consideration how the ingredients will complement one another, and which flavors will be accepted by the public. Regardless of how an individual builds his or her bowl; it has to have that right combination — fragrance from the rice, sweetness from the vegetables or fruits, freshness of the fish, crunchiness from the vegetables or salmon skin, umami flavour and texture from the various toppings, and creaminess from the sauce or the poached egg. All in all, the ingredients should balance one another so as to give that ultimate ‘wow factor’! 7. Is using local and seasonal ingredients important to you? Yes! We definitely use local ingredients here as we want to accommodate to local taste buds. Not only that, sourcing our ingredients locally allows us to maximise the freshest and in-season produce. 8. What is the weirdest ingredient you have considered putting in your menu? Petai, as it is may not be everyone’s cup of tea. However, there are Malaysians who love it, so there’s a possibility we’ll include it in our menu in the future. 9. 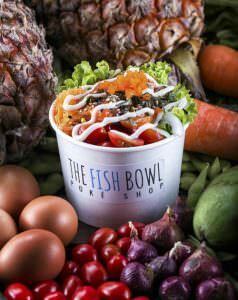 If you could concoct a poké bowl that represent Fish Bowl’s personality, what would the ingredients be? Our standardised bowl — hot steam rice, salad, seaweed salad, cucumber, walnut, mango, shoyu salmon/tuna, furikake, fried shallots, fried garlic, pickled cucumber, sesame seeds, seaweed flakes, ebiko and salmon skin. It stays true to the much loved Hawaiian classic. 10. What is your perspective on the city’s food community? Multicultural, ranging from local to international delights. 11. Finish this sentence. KL has the best….? 12. What are your favorite places to eat, drink and hang out in your neighborhood and what should the community order? 13. Can you share with us one recipe from your signature menu that everyone can make at home? A simple recipe of Shoyu Salmon as follows. This recipe feeds 7-8 people. Combine all the ingredients in a large glass bowl, mixing gently but thoroughly until well combined. Cover the bowl with cling wrap and refrigerate for at least 2 hours, or up to 2 days. To serve, top bowls of cooked rice with desired amount of poké, and enjoy! 14. We can expect more poké bowl restaurants opening in KL in the near future. How will The Fish Bowl set itself apart from the rest? Poké itself is already a unique dish. It doesn’t matter who comes out with the best flavors or combinations, as long as we (all) stay to our roots by using the freshest ingredients and putting our hearts in the food. It will be healthy competition. 15. Thanks for accommodating to our questions! Last one, what’s next for The Fish Bowl? We will be introducing new flavors VERY soon, as well as some cooked items to cater to diners who don’t fancy raw food. Do follow us closely to know if we have any expansion plans. So fishies, stay tuned!